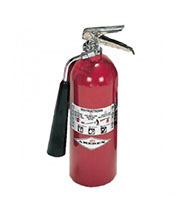 Q: What are the different types of Fire Extinguishers and how can I tell the difference? Q: When should my extinguishers be serviced? A: All extinguishers except for the ABC and BC powder extinguishers should have a hydrostatic test performed on them every 5 years. Extinguishers that use powder such as ABC and BC are required to have 6 year maintenance performed every 6 years and a hydrostatic test every 12 years. Clean Agent Extinguishers such as Halon and Halotron extinguishers are also required to have a 6 year maintenance every 6 years and a hydrostatic test every 12 years. Q: What’s a 6 year Maintenance? A: According to NFPA 10 2013 edition Regulation 7.3.6- 6 Year internal examination of certain types of extinguishers: Extinguishers that Require a 12 Year Hydrostatic test (ABC Extinguishers) must have its contents removed and be examined both internally and externally. Any deficiencies will be corrected and the passed extinguisher will have its maintenance information place on a label. Q: What’s a Hydrostatic Test? A: According to NFPA 10 2013 Edition Regulation 8.1 General: A hydrostatic test is a way in which the fire extinguisher cylinders are tested under pressure using water to ensure there are no weaknesses or leaks in the cylinder’s structure. Both and internal and external inspection of an extinguisher shall always be conducted for a hydrostatic test. Hydrostatic Testing must be performed by certified individuals trained in pressure testing procedures in safeguarded testing facilities with the proper equipment. ABC Fire Extinguishers are normally red and have a gauge. ABC-Powder Extinguishers. Covers Combustibles such as paper (A), Electrical, (B), and Chemical (C) fires. Class K- Wet chemical extinguisher, used on kitchen fires. Water Pressure- Covers only Combustible fires. Water pressures are tall, silver and have a gauge. 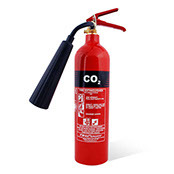 CO2 Extinguishers are red and have no gauge. 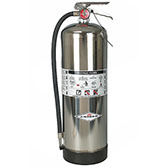 Water Mist- Extinguisher filled with deionized water. Covers combustible and electric fires. © 2016 Rosewood Fire. All rights reserved.